How to Teach Respect for Personal Property. How to teach children to respect the property of others. We have recently been talking about teaching virtues to children. We talked about what character training is and how to teach it to different types of children and we talked about how abstract these virtue ideas are to children and how important our own example is. On Becoming Childwise (affiliate link) talks about some areas you can focus on to make these virtues more concrete for the child and able to apply it to their lives. The first area is respect for property (pages 92-97). Part of respecting property is recognizing that other people count. You won’t respect the property of others if you don’t care about others. Teaching to respect the property of others is not a new notion. “Thou shall not steal.” This commandment was taken a step further in the admonition that we should not covet. I am not sure what things were like exactly when I was a child. What I remember is that it seems like children for the most part had respect for the property of other people. It might be that I remember this because it is such a huge thing to my mom. I think if there is any one overarching virtue my mother stressed in teaching us was respect for other people. This meant respect for people, their things, their age, their sleep…we were trained to think of other people. I know as a child, I never would have dared disrespect a person or their property. 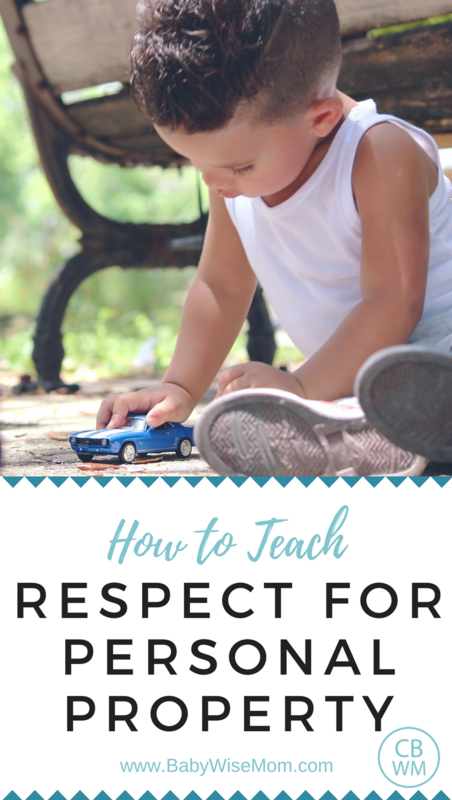 Understand that teaching children to respect the property of others is tied to respecting others and is also tied to “thou shalt not steal” and “thou shalt not covet.” Those are three great reasons to take teaching respect for property seriously. There is the “why” you are doing this. Like any training, it starts in your home. You teach your children to respect the property of you, your spouse, and siblings. Remember way back to Babywise II when it talks about not allowing the child to play with the remote control at home? Does that seem silly to you? The idea behind it is to train the child to have respect for property that is not his. When I read that in Babywise, I purposely put some things in Brayden’s daily path that were off-limits to him. I taught him not to touch those things. The concept here is to house-proof your child, not child-proof your house (see Child-Proofing vs. House-Proofing and Baby-Proofing for more). 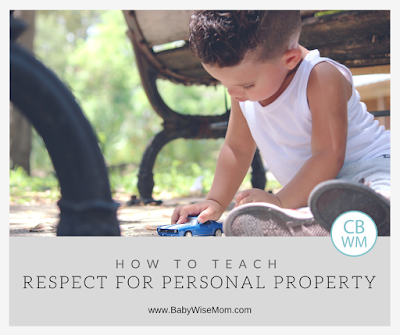 When your child is able to respect property at home, he will then have the skills needed to do the same at the home of a neighbor or of grandma. He will resist the urge to run into the neighbor’s garage or backyard and go through his things. He will realize he is not entitled to touch, play with, or have whatever he sees that strikes his interest. Focus on the fact that we are respecting the property of others out of love and respect for others. We aren’t showing value in the things themselves, but in the person who owns the things. This helps the child respect property no matter how valuable it seems to the child. You respect the property no matter how valuable or invaluable you deem it to be–you do so because you value the owner. A great example in the book is lawn condition. Whether the lawn is perfectly manicured or overgrown with weeds, you don’t throw your litter on the lawn. The condition of the lawn is unimportant to what respect you show for the property. It is valuable to allow your child to work for something he wants. Does he want a new Lego set? You could tell him to wait for Christmas or his birthday. You could even buy it for him. A valuable teaching moment is to have him work to earn the money for that set. This teaches the child the value of the object, and children are smart enough to correlate that to other things. Brayden is always earning money toward some Lego set. He also looks through the grocery store ads to tell me what is on sale because he realizes that getting something on sale is a great money-saving tool. The training for teaching your child to respect the property of others will ideally start even as babies as you teach your child limits. As your child reaches three years old, you start to teach the “why” behind it all while keeping the same standards. Teaching your children to respect the property of others is a great, concrete way to teach moral character. People who respect other people and their property are such a blessing in society!